Today is the “National Day of Unplugging”: 24 hours of “digital detox”. From sunset on March 23 until sunset of March 24, participants are encouraged to power down ALL devices in order to slow down your life in this hectic digital world. This information was first sent to me by a friend who knows my penchant for “family time” and quiet time, and she wanted to know if technology had finally managed to change the rules of my household. In short, had technology changed me and my priorities? This is a great question for all of us. As educators, is technology changing our classrooms for the better? As parents, is technology enhancing our relationships with our children or driving us apart. Do the friendships we have grow deeper through technology or keep us all functioning at a false level of interaction? In this day of sharing so much information, do we run the risk of diminishing our relevance? In looking into this “National Day of Unplugging”, I was very surprised by the technology professionals involved in encouraging weekly sabbaticals from technology use, saying that it “…gives more power in their day-to-day lives”. 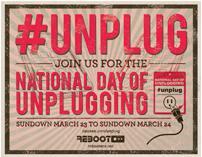 For information on the National Day of Unplugging, visit the Sabbath Manifesto. Previous Previous post: Congratulations Varsity Track Teams!